team small dog: Useful tips for dog exercise during pony camp. 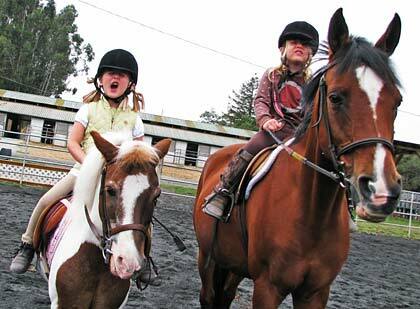 Useful tips for dog exercise during pony camp. When there is a plethora of small children, ponies and dogs, one must exercise great creativity to exercise one's dogs. Here are some ideas if you find yourself overrun with pony campers. Dressage is sort of the like obedience of horse stuff. It's a nice idea to dabble in it for better, stronger, faster, funner agility, but you know, wouldn't want to spend too much time there. However, it's made funner if you just leave the ponies back in the barn and let the small children run around the dressage ring with the dogs. Much galloping-you never see THAT in dressage. Use sits for halts. Switch dogs a lot. Word has it that Gustavo is a really good dressage dog due to cuteness and speed. Otterpop is popular for the speed element but sometimes freaks the kids out due to her sheer, Otterpopness. Only the bravest kids do dressage with Otterpop. Ruby is sort of popular with the slower kids because she likes to dig holes in the dressage ring looking for racoon poop and likes the shady tree near letter F.
If storytime happens near the boring pen, then letting dogs out of the boring pen to sit on laps alleviates the problem of howling during storytime. Misty of Chincoteague is not supposed to contain howling. There isn't usually howling at work, although there isn't usually storytime at work. Small children can go to blows about who Gustavo gets to sit with and Gustavo equals We Are All Friends and We Are Sharing. Ruby sits with anyone eating snack, and as usual, only the bravest among the small children enjoy having an Otterpop stare at them. Because Otterpop truly believes that all small children are armed with tennis balls and have the ability to produce them out of breeches at any time. Storytime is just a lot of on the couch, off the couch. On the couch, off the couch. Frog ponds are useful places for dog exercise however, it's not nice to frogs to feed them to the dogs. Don't feed dogs frogs. At the end of a long day of pony camp, the only exercise available to dogs may be drag racing in Lighthouse Field behind the bike. Hopefully this is a sport that homeless campers sleeping in bushes enjoy, because there is shouting. To get the fastest racing, you have to yell, "RACER RACER RACER!" It's best done when it's nearly dark so that there's no rangers and so that you can almost hit unsuspecting park walkers who didn't realize they were walking on the drag strip. Sorry old guy with your sleeping bag on your back! The rules are pretty easy. The fastest dog to race from Trashcan A to Trashcan B n the field behind my bike gets a cookie. Then you go Trashcan B to Trashcan A. And you do it again. And again. And again. Until dog tongues are drooping and Ruby just sits and waits at the startline for a few more heats to go down and back at 100mph and it's time for her to climb back in the racing basket. Gustavo and Otterpop are a pretty good match for drag racing. They usually tie. I would really like to attend Pony Camp. Please send registration materials. Prefer "King of the Wind," but "Justin Morgan Had a Horse" acceptable. We will have pony camp again next year. I think I can only have one pony camp per year or I will grow too many gray hairs. Although if you are old enough to spell, you are too old for pony camp! Both of those books are in the pony camp library! I went to adult pony camp when I was 40. I missed storytime. I would have liked that. Instead we mucked the paddocks.